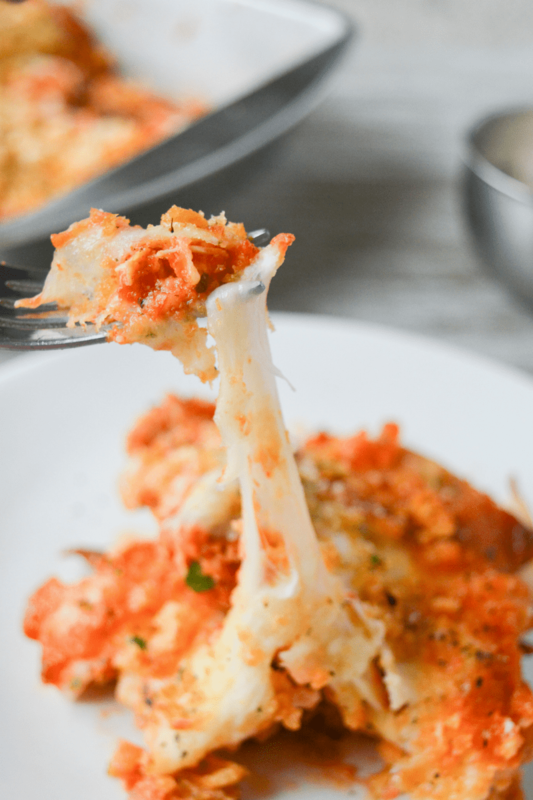 This Keto Chicken Parmesan Casserole is a super easy dinner recipe that’s bursting with savory, flavorful, cheesy, tomatoey flavor! Your whole family will love it, and you’ll love how simple it is to put together! 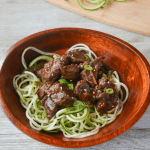 This recipe is used with permission from Easy Keto Dinners by Carolyn Ketchum. 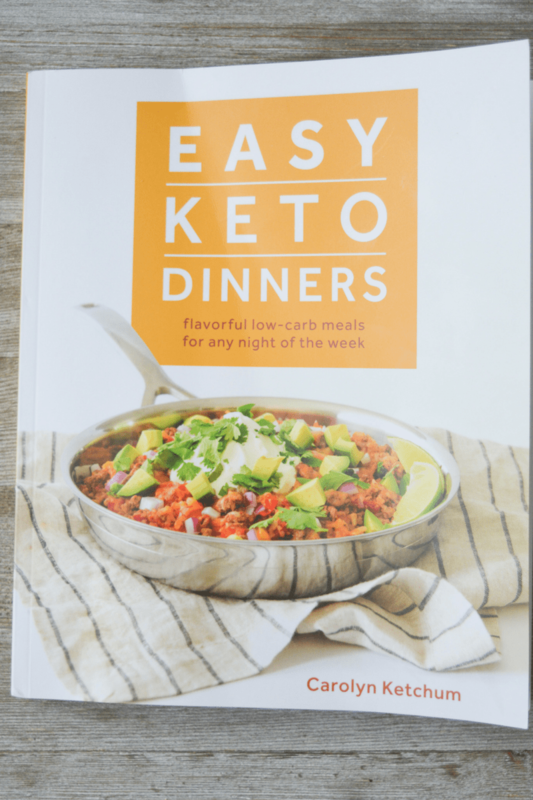 I was so excited to receive a copy of Easy Keto Dinners by the outstanding author, Carolyn Ketchum of All Day I Dream About Food, I couldn’t wait to share a recipe with you. By couldn’t wait, I mean it. This cookbook came in the mail just yesterday! That’s how excited I am about it. 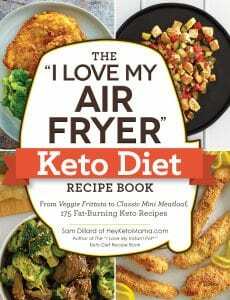 Carolyn is an incredible low carb influencer who is also the author of The Everyday Ketogenic Kitchen, another fantastic resource for anyone following a keto diet. When I say the dinners in this cookbook are easy, I mean EASY. But they are in no way recipes that are just for beginners. 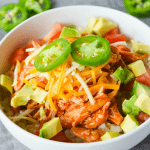 Easy Keto Dinners is full of 50+ crowd pleasing recipes that are made with ingredients you already have in your fridge and pantry. 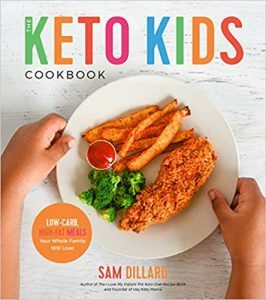 With all of life’s hustle and bustle, what could be better than healthy, low carb, delicious meals that you can whip right up and serve to your family? Carolyn gets it, and she NAILED it. 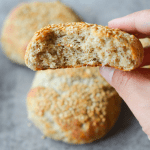 The recipe I’m sharing today is a fun, keto spin on one of my favorites from my higher carb days. Chicken Parmesan. I love casseroles, especially at the end of a long day. There’s something just so satisfying about throwing everything into a dish and popping it into the oven…even more satisfying when the result is delectable AND good for you! 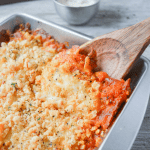 This recipe has such yummy Italian flavors, and even includes one of Carolyn’s bonus recipes for Cheaters Tomato Sauce, low carb goodness you can ONLY find in Easy Keto Dinners. To make the recipe even quicker, Carolyn suggests using your favorite no-sugar-added marinara in place of the easy Cheater’s Tomato Sauce, so don’t worry if you haven’t ordered your copy yet! My go-to is usually Rao’s Homemade Marinara Sauce (only 3 net carbs per 1/2 cup serving)! Enough talk…it’s time to get to the good stuff! Here’s how you make it! Spread the chicken in the greased dish and pour the tomato sauce over it. Sprinkle with the red pepper flakes. Top with the Parmesan and then the mozzarella. Lightly sprinkle the rushed pork rinds and basil over the top. Bake for 25 minutes, until the cheese is melted and bubbly. This recipe can be frozen either before baking or after, and it’s easy to prep a day ahead. Just be sure to wrap it up tightly with foil before putting it in the freezer or fridge. Thank you so much! By the way, great “cheese pull” photo! super easy recipe.I tried it and it came out well like you said, my whole family liked it. Good idea. It’s only 10 Am in the morning and now I’m hungry. Can’t wait to try this and it looks fairly simple. This one looks one of the easiest recipes that I am checking today. I’ll make sure to make it and let you know with the results. Little confused here, do you precook the chicken first. ???? My sauce doesn’t say “added sugar”, but has sugar in it. What’s a good guideline for an acceptable amount of sugar in the sauce? Or should there not be any sugar at all? I don’t think you’ll be able to find any that has 0g only because tomatoes have natural sugars that will always be included. The one I use (Rao’s) has 3g of sugar–that’s probably the highest I would go. Delicious! I ended up making my own marina, we loved this recipe! If I don’t like pork rinds, will I still like this? Hmmmm….this recipe looks amazing, but I was questioning the calorie/macros count. I put all the ingredients into a recipe analyzer and came out with 259 calories for one sixth of the recipe. How did you get the numbers you published??? Will try this tonight!! This was great. Even my husband who is not a big chicken fan liked it. I used crushed cheese whisps instead of the pork rinds and it was a great substitution. Thank-you for all the wonderful recipes. 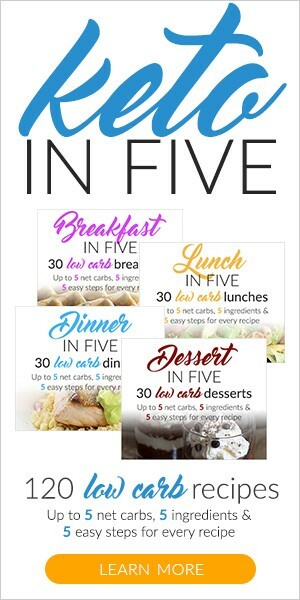 I just recently discovered your site and have been book marking a lot of recipes. I also just purchased your cookbook from amazon s/b here tomorrow. Can’t wait to receive it. I usually cook on the weekend so when I get home from work I just need to re-heat. I’ll be making the keto chicken parm, and the spinach artichoke chicken for starters. They both looked so wonderful I couldn’t choose, so I’m doing both. Can you substitute the pork rinds? Not a big fan! You can definitely leave them off and it will still be tasty! This recipe was great. My picky 11 yr old even liked it. Just starting out this the Keto journey. Thank you. Tried this out the other night and it was delicious! I switched the basil on top for pesto because I didn’t have any just basil but it was delicious! Will definitely be making it again! Yay! So glad you enjoyed it!! Have it baking right now. Can’t wait to taste it!!! A serving size is 1/6 of the pan. One cup of grated Parmesan is 3.5 ounces. I boiled the chicken first and then made it exactly like this. It came out amazing! Best recipe I’ve found yet! So easy and super yummy! Perfect weeknight meal the whole family will love. Mine did! Did you use plain pork skins? Yep! you can use whatever flavor you’d like to though. I don’t eat pork. What’s a substitute for pork rinds? You can definitely just leave it off! If you like cheese crisps like whisps or parm crisps, those would work great too! My particular eat8ng plan doesn’t include tomatoes, but I know of a keto Alfredo sauce I could make as an on-plan substitute. Thanks! It’s a nice idea but the macro’s are terrible for keto. Protein shouldn’t be much higher than carbs and most definitely not higher than fat. Very easy way to push your body out of ketosis. Really bad. Like diced chicken sitting in tomato soup. Hated wasting all that chicken. Delicious! I can’t say that I measured anyting but used all of these ingredients and technique. I homemade my sauce, though. I precooked the chicken in my NuWave oven which always seems to turn out better than in my Instant Pot. 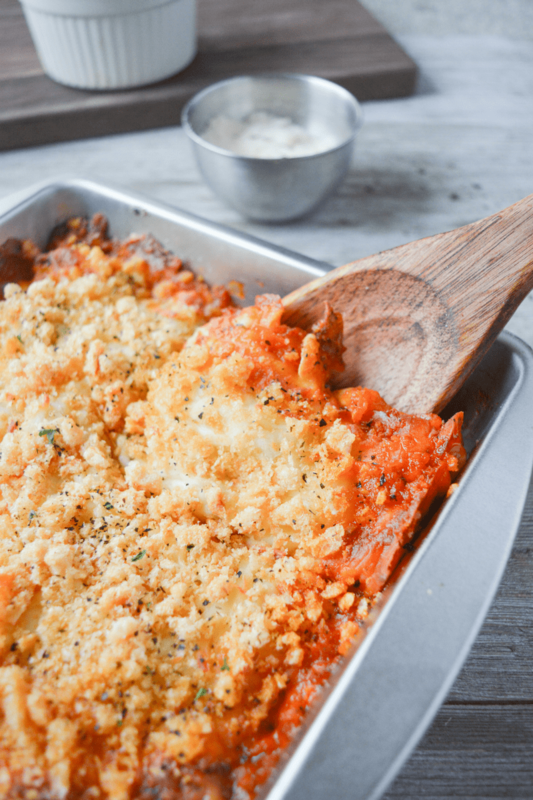 This recipe is both tastier and easier than non-casserole style low carb chicken parmesan recipes I’ve tried. I will probably only make it casserole style from here on out! Made that this tonight. I stopped at the store right after work and assumed I had tomato paste home so I left it off my grocery list. Instead I used diced tomatoes. It came out a bit runny but still good. I enjoyed it with plain yellow rice. I will be using this recipe again and next time only usearinara and tomato paste. Dispite me leaving out the tomato paste everything still taste yummy. The macros are good, but 1/6th of an 8-inch pan seems like a fairly small serving. Could this be done even lower carb by reducing the amount of marinara sauce? Maybe replacing in whole or in part with fresh herbs? Or pesto or alfredo? Any thoughts on how well that would turn out? I made this this evening. Delicious and easy! Thank you!! Very good! Altered the recipe a bit for my taste. Turned out great! Can you save time by not pre-cooking the chicken? I’ve seen it done, but the person had to bake it for much longer to make sure the chicken was cooked all the way through. If you grabbed a rotisserie chicken or some other pre-cooked chicken from the store, that would really help cut down time. 5cups cooked cubed chicken seems like an awful lot of chicken. Am I misreading this? I made shredded chicken in the crockpot first, then followed the recipe. It was delicious. Delicious. Great way to start off the week in keto. I also added cream cheese. 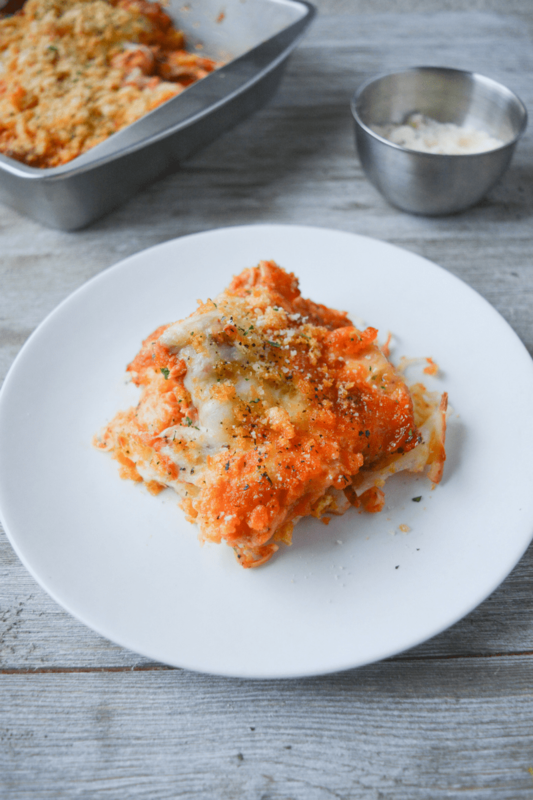 I had high hopes for this recipe and it was SUPER easy however, did not reheat well at all…that was the disappointment since I’m all about meal prep for easy work lunches.